Fire corals are colonial marine organisms that exhibit physical characteristics similar to that of coral. The name coral is somewhat misleading, as fire corals are not actually true corals but are more closely related to Hydra and other hydrozoans, making them hydrocorals. They are members of the phylum Cnidaria, class Hydrozoa, order Capitata, family Milleporidae. 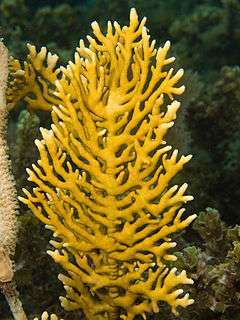 Fire corals have a bright yellow-green and brown skeletal covering and are widely distributed in tropical and subtropical waters. They appear in small brush-like growths on rocks and coral. Divers often mistake fire coral for seaweed, and accidental contact is common. Upon contact, an intense pain can be felt that can last from two days to two weeks. The very small nematocysts on fire corals contain tentacles that protrude from numerous surface pores (similar to jellyfish stings). In addition, fire corals have a sharp, calcified external skeleton that can scrape the skin. Fire coral has several common growth forms; these include branching, plate, and encrusting. Branching adopts a calcerious structure which branches off, to rounded, finger-like tips. Plate growth adopts a shape similar to that of the smaller nonsheet lettuce corals - erect, thin sheets, which group together to form a colony. In encrusting growth, the fire coral forms on the calcerious structure of other coral or gorgonian structures. The gonophores in the family Milleporidae arise from the coenosarc (the hollow living tubes of the upright branching individuals of a colony) within chambers embedded entirely in the coenosteum (the calcareous mass forming the skeleton of a compound coral). Fire corals are found on reefs in the Indian, Pacific, and Atlantic Oceans and the Caribbean Sea. They form extensive outcrops on projecting parts of the reef where the tidal currents are strong. They are also abundant on upper reef slopes and in lagoons, and occur down to 40 m deep. The polyps of fire corals are near microscopic size and are mostly embedded in the skeleton and connected by a network of minute canals. All that is visible on the smooth surface are pores of two sizes: gastropores and dactylopores. In fact, Millepora means ‘thousand pores’. Dactylozooids have long fine hairs that protrude from the skeleton. The hairs possess clusters of stinging cells and capture prey, which is then engulfed by gastrozooids, or feeding polyps, situated within the gastropores. As well as capturing prey, fire corals gain nutrients via their special symbiotic relationship with algae known as zooxanthellae. The zooxanthellae live inside the tissues of the coral, and provide the coral with food, which they produce through photosynthesis, so require sunlight. In return, the coral provides the algae with protection and access to sunlight. Reproduction in fire corals is more complex than in other reef-building corals. The polyps reproduce asexually, producing jellyfish-like medusae, which are released into the water from special cup-like structures known as ampullae. The medusae contain the reproductive organs that release eggs and sperm into the water. Fertilised eggs develop into free-swimming larvae that will eventually settle on the substrate and form new colonies. Fire corals can also reproduce asexually by fragmentation. Fire corals face the many threats impacting coral reefs globally, including poor land management practices releasing more sediment, nutrients, and pollutants into the oceans and stressing the fragile reef ecosystem. Overfishing has ‘knock-on’ effects that result in the increase of macroalgae that can outcompete and smother corals, and fishing using destructive methods physically devastates the reef. A further potential threat is the increase of coral bleaching events, as a result of global climate change. Most fire coral species have brittle skeletons that can easily be broken, for example, during storms, or by divers when diving for leisure, or when collecting fish for the aquarium trade. For instance, the yellowtail damselfish (Chrysiptera parasema) tends to dwell close to the branching fire coral colonies, and retreats into its branches when threatened. In Brazil, fire coral colonies are extensively damaged when harvesting the yellowtail damselfish, as the corals are often deliberately smashed and fishes hiding amongst the branches are ‘shaken out’ into plastic bags. Fire corals are listed on Appendix II of the Convention on International Trade in Endangered Species (CITES). W. H. de Weerdt & P. W. Glynn (1991). "A new and presumably now extinct species of Millepora (Hydrozoa) in the eastern Pacific" (PDF). Zoologische Mededelingen. 65 (20): 267–276. Idaz Greenberg (1986). Guide to Corals & Fishes of Florida, the Bahamas and the Caribbean. Seahawk Press. p. 60. ISBN 978-0-913008-08-9. This article incorporates text from the ARKive fact-file "Fire coral" under the Creative Commons Attribution-ShareAlike 3.0 Unported License and the GFDL. ↑ "The Fire Corals". Aquarium Net. October 1996. Retrieved 2007-07-03. 1 2 Veron, J.E.N. (2000) Corals of the World. Vol. 3. Australian Institute of Marine Sciences, Townsville, Australia. ↑ Veron, J.E.N. (1986) Corals of Australia and the Indo-Pacific. Angus and Robertson Publishers, UK. ↑ Wood, E.M. (1983) Reef corals of the world: biology and field guide. T.F.H. Publications, New Jersey, USA. ↑ Wilkinson, C. (2004) Status of Coral Reefs of the World. Australian Institute of Marine Science, Townsville, Australia. ↑ Wilkinson, C. (2004) Status of Coral Reefs around the Word. Australian Institute of Marine Science, Townsville, Australia. ↑ Gasparini, J.L., Floeter, S.R., Ferreira, C.E.L. and Sazima, I. (2005) Marine ornamental trade in Brazil. Biodiversity and Conservation, 14: 2883 - 2899. ↑ CITES: Appendices I, II and III Retrieved 2011-08-24. ↑ Peter Schuchert (2011). P. Schuchert, ed. "Millepora Linnaeus, 1758". World Hydrozoa database. World Register of Marine Species. Retrieved November 2, 2011. Wikimedia Commons has media related to Millepora.